I have been seeing this play out in my geometry classes each of these past six school years. It’s been a tricky problem for me to figure out and once I started to see what was going on, it became even harder for me to communicate it. I think I am ready to try. Each year, a fresh cohort of young people come in straight from Algebra I. In theory, I can assume that they are fully loaded with algebra skills and thought-processes that will support them through their study of Geometry. There is one glaring hole in their understanding which I attributed to the overall youthfulness of many of my geometry students. They are 13-15 years old and, for the most part, their math experiences lack a significant diversity. So, I am able to give them a pass on some of the ways they are still developing as math learners. But then I saw the same deficiency in my calculus students that I am only seeing now because this is my first year teaching calculus. Suppose that I give a geometry student this problem and ask them to find the angle measures of each angle. Or suppose I gave my calculus students this problem. The primary difference between the work I’m asking my Geometry and Calculus students to complete and the work that they are used to in the Algebra I and Algebra II is in the latter the equations are provided and in the former, the students are required to write the equation. This is no small point. No side conversation. I am not splitting hairs. I am convinced this is a big difference. Let’s go back to our Geometry problem. First and foremost, recognize that there is very little natural or intuitive about this set-up as a whole. 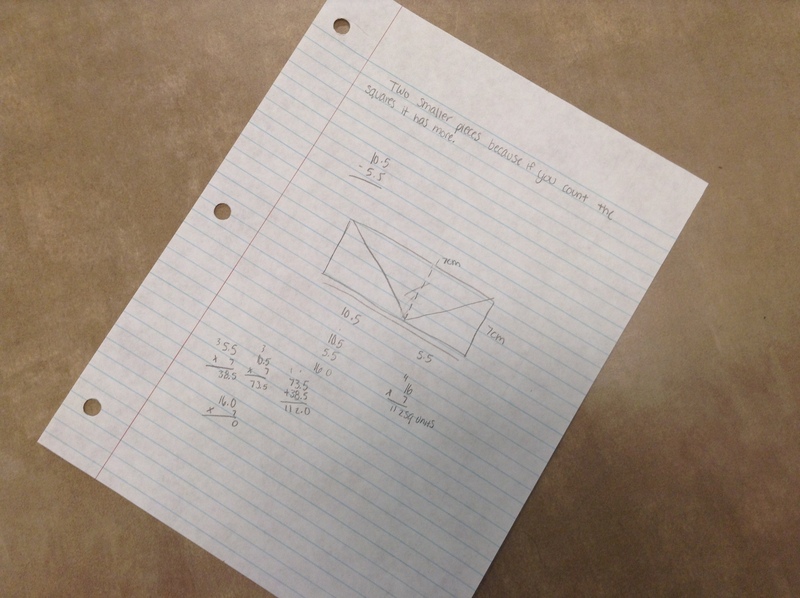 There is very little reason why angle measures are represented with algebraic expressions. 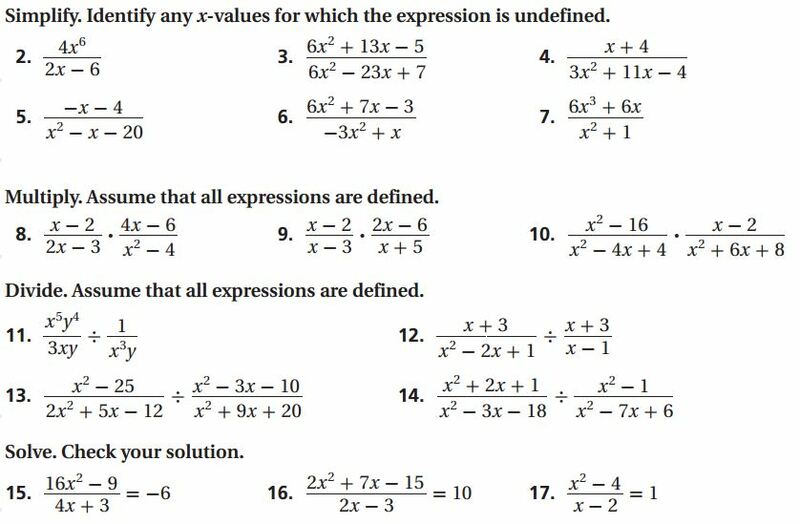 The variable “x” doesn’t represent any actual value and so, the students are left to their abstract understanding of how equations are built in order to solve this problem. Their previous experience hasn’t really prepared them for this. Overwhelmingly, their mathematical experience leading up to this point has trained them to know how equations are solved. Let’s expand this to our calculus team (of 23) of whom I noticed only about 8 or 9 who seemed comfortable modeling volume and surface area with equations and then engaging the formulas. 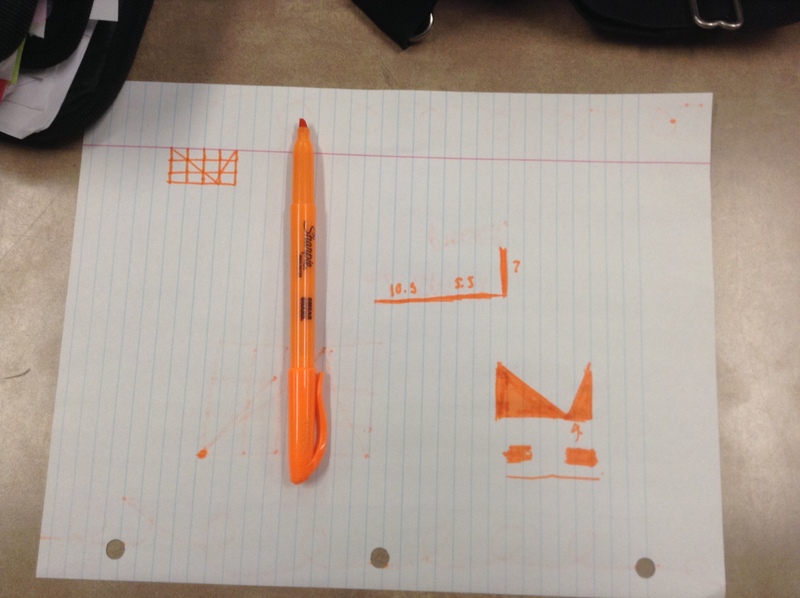 So, even among our most talented high school students, there is a problem with the use of equations as modeling tools. Once they have them, they can operate with them wonderfully, but they struggle when it comes to writing them to specifically to match a specific situation. And beyond that, checking the accuracy of the model and then making sense of the product once they are done. Herein lies the major issue: the paragraph above highlights a variety of skills that students (at all levels, from what I can tell) struggle with. They seem to struggle with them because they aren’t practicing them. But those are the skills that actually make mathematics worth doing to EVERYONE. The ability to do complex arithmetic on a rational or logarithmic expressions is something that is going to come in handy to people for whom formal mathematics is going to extend into their post-secondary lives. This isn’t a high percentage or our students, but these skills constitute a high percentage of the problems in our textbooks. On the other hand, being able to recognize a situation as linear, quadratic, logarithmic or rational and have a sense of how to model that in order to make some predictions? That is something that could be valuable to a higher percentage of people outside of school. I think that we need to recognize that the specific skills that we are teaching our math students are a means, not an end. They are the tools, not the final product. The real goal is for the students to explore a situation, recognize the mathematically significant parts and use their math tools to model the situation strategically to help them achieve their goal. In addition to our student being better, more confident, flexible and patient problem-solvers, it seems like we’d also hear “when am I ever going to use this?” a whole lot less. It’s been about three years since I started weaning myself (and my students) off textbook-dependent geometry lesson-planning and toward something better. I’ll admit the lesson planning is more time-consuming (especially at the beginning), but most of the time expenditures are one-time expenses. Once you find your favorite resources, you bookmark them and there they are. The second thing that I noticed, though, was that I had less of a script already provided. The textbook takes a lot of the guesswork out of sequencing questions and content. When the textbook goes, all that opens up and it fundamentally changes lesson planning. The lesson becomes more of a performance. There’s an order. There’s info that you keep hidden and reveal only when the class is ready. Indeed, to evoke the imagery of Dan Meyer (@ddmeyer) it should follow a similar model to that of a play or movie. But, see… here’s the thing about the “performance” of the lesson plan. The students have a role to play as well… and they haven’t read your script… and they outnumber you… and there is a ton of diversity among them. So, when you unleash your lesson plan upon them, you have a somewhat limited ability to control where they are going to take it. If a student puts together a fantastic technique filled with wonderful logical reasoning that arrives at an incorrect answer, you have to handle that on the fly. It helps to be prepared for it and to anticipate it, but the first time you run a problem at a class, anticipating everything a class of students might do with a problem can be a tall order. The candy pieces made a grid. The rectangles were congruent. Let’s start there. The Hershey Bar Problem was unleashed for the first time to a group of students. Our department has agreed to have that problem be a common problem among all three geometry teachers and to have the other two teachers observe the delivery and student responses (I love this model, by the way). The students did a lot of the things we were expecting. But, we also watched as the students took this in a directions that we never saw coming. 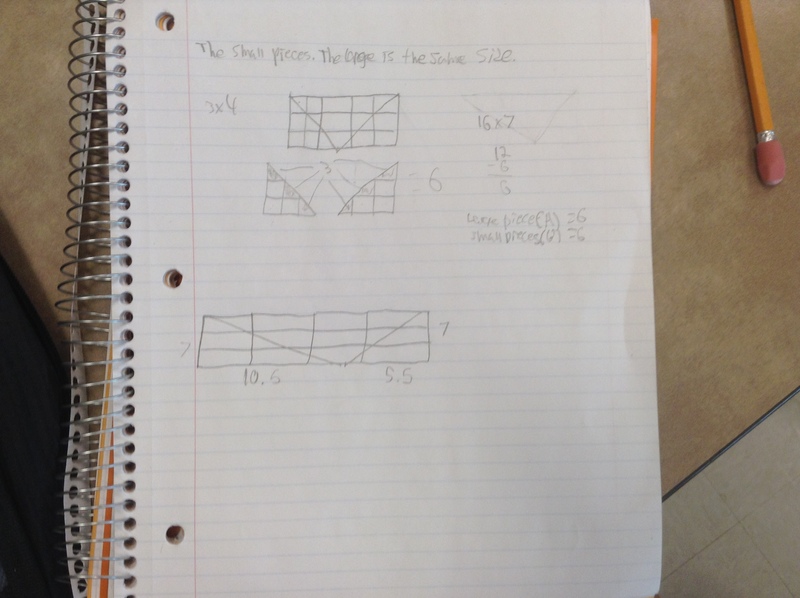 The student began using the smaller Hershey rectangles as a unit of measure. One of the perplexing qualities of this problem is that the triangles are not similar or congruent. Well, the rectangles are both. So, as we watched, we weren’t sure what conclusions could be drawn, what questions the students might ask, or how strongly the class might gravitate toward this visually satisfying method. We didn’t want to stop her. We weren’t sure if we could encourage her to continue. We just had to wait and watch. That causes anxiety. It feels like you aren’t in real control of the lesson. In the end, most of what we anticipated ended up happening. The team trying to estimate rectangle grid areas ended up seeking a different method for lack of precision and everything got to where it was supposed to. The experience is valuable. But the anxiety is real. And I suspect that the anxiety has a lot to do with why the textbooks continue to stay close at hand. When the structure leaves, the curriculum opens up. When the curriculum opens up, the task of planning and instructing becomes more stressful and (for a short time) more time-consuming. If you are reading this and on the cusp of trying to move away from your textbook, please know that this is the right move. Your book is holding you and your students back. You can do this. I won’t say that there is less stress, but with more authentic lessons, there’s more authentic learning. About a month ago, I posted The Hershey Bar Problem in which I discussed, among other things, the ways in which I rip off other teachers work. This is an example of that. This is a Dan Meyer rip-off pure and simple. I just want to cover myself in that regard. As usual, all constructive feedback is welcome. Act II – Dimensions of the Hershey Bar or Dimensions of the segments after the cuts.